Canada became more and more French the farther east I traveled. 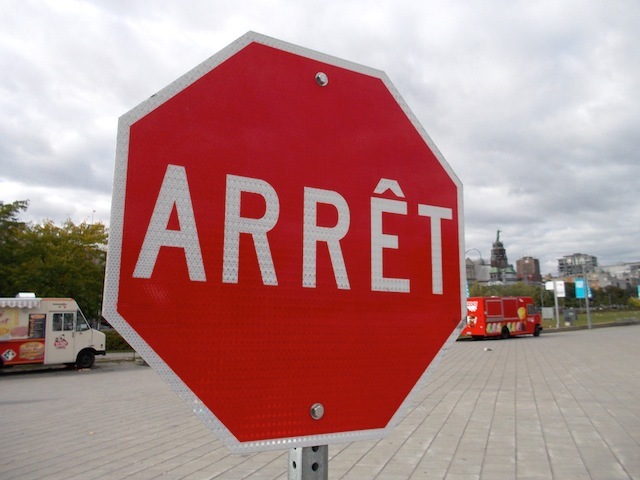 Ottawa was the turning point, as practically everyone working at any place spoke both English and French. Even the buses announced stops in both languages. That was not the case in cities I visited west of Canada’s capital. 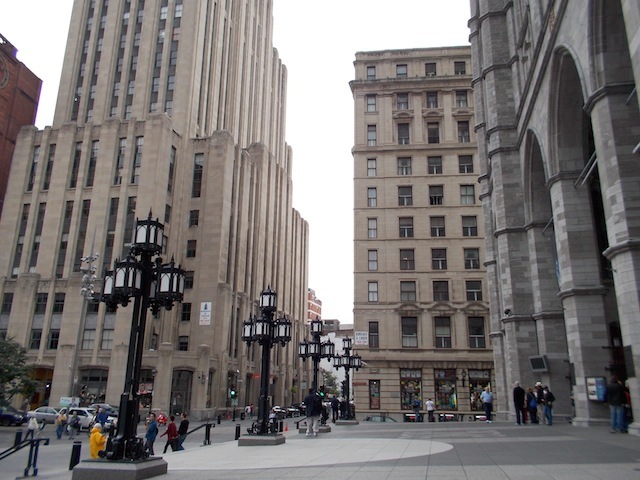 Upon arriving in Montreal, I immediately felt as if I were in a different country, mainly because I heard French everywhere and because of the architecture. Alexandrie Hostel was my next stop, and it was a few minutes away by foot from the Greyhound station. Similarly to the Canadiana in Toronto, my dorm room wasn’t accessible through the lobby. I had to walk outside of the building to get to my bed. The room was in an enclosed area that had other rooms, a bathroom, a kitchen, a small dining area, and a small common area. It was kind of like a hostel within a hostel since all these amenities were accessible without having to go outside. Common area in one section of the hostel. I settled into my dorm and later on met the mates who’d be staying in the same room: Brooke (from Australia), and Miguel and Pierre (exchange students from Paris studying for a semester at the University of Ottawa). Brooke was taking a year off after graduating from high school to travel North America for several months. Miguel and Pierre were visiting Montreal for the weekend. In the evening we grabbed some McDonald’s for dinner. I opted for a wrap with veggies. And although I ordered before many people, many others were served first. “Maybe they’re still picking the lettuce because they don’t make healthy food here,” the guys joked. They met at the Quebec City Airport. Sebastian approached her to ask if she wanted to split a cab, as that is the only straight-shot way to get to Old Town Quebec. Brooke said she was initially skeptical, but agreed. And from there they headed to Montreal, and coincidentally ended up staying in the same hostel. From there, they were going to go to Ottawa and were also going to stay at the same hostel. There were a few days between their arrivals and departures to and from these cities, but their itineraries were nearly identical. They even met up in New York! For the next couple of days, these are the people I explored Montreal with, and it was a lot of fun. One of the nice perks about Alexandrie Hostel is that there’s free breakfast! That’s a godsend when you’re budget traveling 🙂 There was coffee and toast, and that’s more than enough if you think about how much you’re not spending on eating out. After breakfast, Brooke, Miguel, Pierre, Sebastian and I got ready to walk around the city. I hopped into the shower to freshen up. Then I got dressed and was ready to abuse my camera. But Pierre suggested I dry my hair first, as walking around with it wet could cause sickness. In fact, he had a hair dryer I could borrow! “A guy with a hair dryer?? ?” I was thoroughly amused. Still, it was a warm gesture, and I did accept his offer. The next few days were eventful, and even though we only hung out for a short amount of time, every minute was well spent. One of our stops, Mount Royal, stands out in particular. We used public transit to get there, and we were still on the bus while figuring out how much money we needed to pay bus fare. I think it was Brooke and Sebastian who didn’t have enough for the fare, and we remained standing in front of the bus, scrambling to find enough money. I had collected all my Canadian coins into a ziplock bag because my coin purse broke. So I pulled it out and began fumbling around for coins to help pay for the fare. 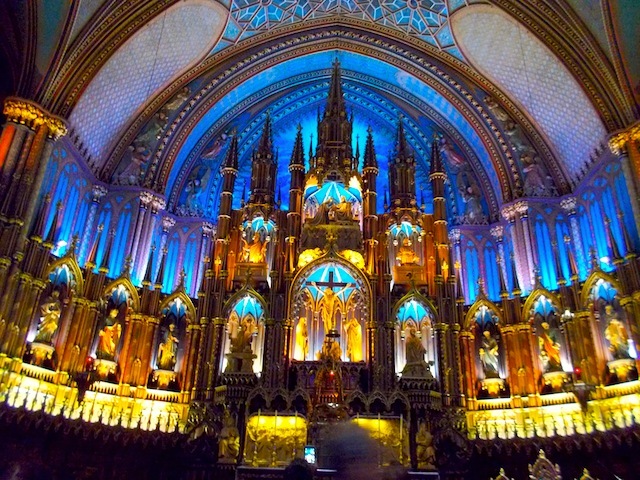 In the evening we watched a presentation inside the Notre Dame Basillica. It is an amazing work of architecture. Moving to Canada in less than two weeks and your pictures are making me really look forward to it, nice one !